As soon as the iodine hit my nostrils and the roar of the surf beat against my eardrums, I felt better. My spirits still affected by a lingering bout of “man-flu”, I had headed for the shore to clear my head and recharge my batteries. I was not disappointed. Crouching down to explore the wonderful world within a rock pool, my mood was heightened further. I became totally absorbed by the fascinating fauna and flora that make up the living components of this tiny but special ecosystem. It may seem odd to refer to a rock pool at Baby Bay as an ecosystem. But it has the same components as any other ecosystem, be it as large as a tropical rain forest or as small as this bit of rocky shore. All ecosystems contain living things (the biotic component), the physical environment (the abiotic component) and a source of energy. It boggles my mind to think of how all these components interact with each other to form a relatively self-contained system. 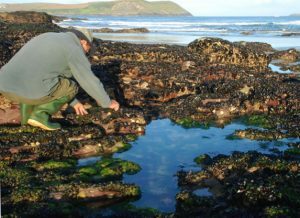 At low tide, it is easy to regard a rock pool as a separate entity. But it is only relatively and not completely self-contained, linked to the rest of the world and other ecosystems. This link is most apparent when we see an incoming tide flood a pool and an outgoing tide drain it. The flood completely refreshes the sea water and brings in new organisms from the open ocean. It also changes the physical characteristics of the pool and its surroundings.